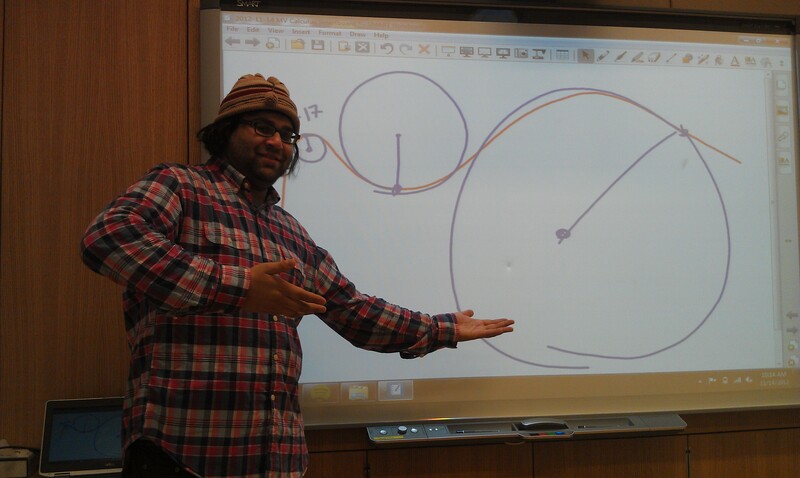 My name is Sam Shah, and I am a math teacher in Brooklyn, New York. And this is a day in my life. Prelude to this day: This day is Wednesday. I had been feeling awful since last Thursday, but I slogged through school that day, and the next day, and slept and rested the entirety of Saturday and Sunday (with some planning on Sunday). I made it to school on Monday, but I was not recovered, and so, finally, thankfully, I decided to stay home on Tuesday. I woke up at 5am on Tuesday, decided I couldn’t go in, that I needed to rest more to recover, and wrote up sub plans. I stayed in bed all day and the sickness dissipated. I felt better. This day is Wednesday, and this is the day I return to school after being sick. 5:50am: I wake up naturally, even though my alarm is set for 6am. It is a bit earlier than I am used to getting up, but here’s the rub: I was sick on Tuesday and left my laptop and school materials at school on Monday. And although I had planned my other classes, the one class I had not prepared was Precalculus. I mean, I knew what I needed to do, but I just needed my laptop to get it ready. So I woke up early to get to school early, to finish planning for first period. So I wake up naturally, and jump to it. 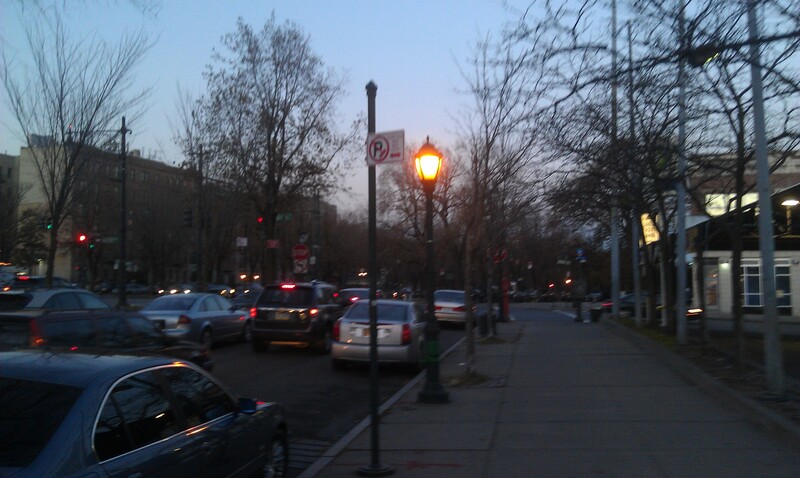 I shower, go through my daily ablutions, throw on clothes and at 6:37am I walk to the subway. It’s light out and even though I’m not fully well yet, it feels good to be out of bed and going somewhere. 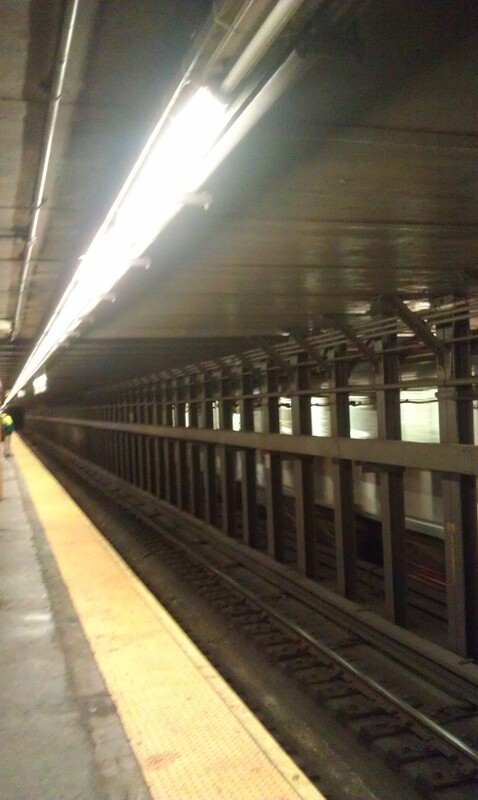 It’s slightly earlier than I usually take the subway and there aren’t many people waiting for the train. Nice. 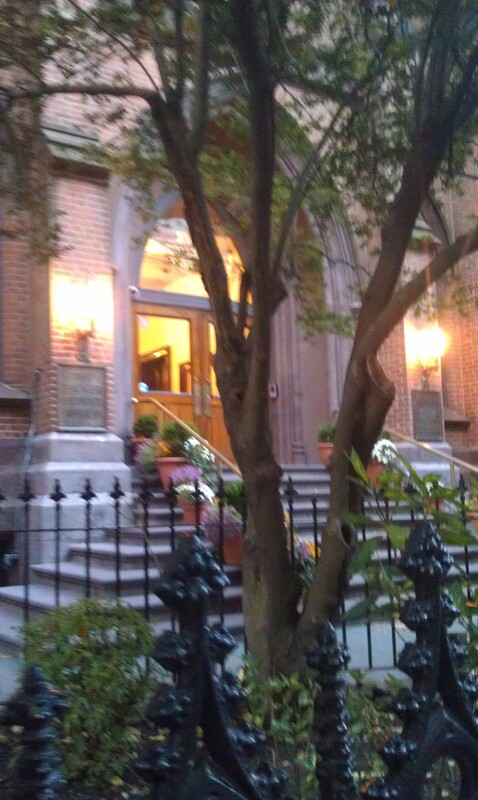 6:57am: I arrive at school. I huff and puff up the stairs to the fourth floor, and as usual, there are two other math teachers already there working. These two colleagues of mine arrive super early. They are super human. And they live farther away from the school than I do. Dedicated. I hunker down at my desk and think “Okay. Okay. It’s going to be okay. You have one hour to get things together.” I focus. I spend the next hour crafting a SmartBoard for the Precalculus lesson I have to give first period. I had already pretty much planned in my head, but it needs to be made concrete. It’s not all that glamorous, but it is organized, and will make sure that students are in a classroom where there is a flow and there is a clear direction to what we’re doing. Part of the class involves students creating their own “unit circle” so I put colored pencils, the blank template they will be using, and a ruler in each group’s folder (this saves me time in class). As it’s gets closer and closer to the start of homeroom, I get more and more stressed out about finishing everything. But I do finish everything. 8:08am: Instead of homeroom today (I am a tenth grade adviser), there is a special meeting for 10th graders held in the chorus room. It is about spending their junior year abroad in China, Italy, France, or Spain. Later this day, sophomore students will hear about two other study away opportunities — both in the united states. I’ve seen this presentation before. A few times. And each year I’m struck by how impressive it is that some of our students study away for a semester or year in high school. And also… why can’t the presenters be more dynamic and have a better script? It goes slightly over, and I refuse to be late to any of my classes because I am a stickler about punctuality (my class time is my class time) so I leave and head up to the room I teach in first period (I teach in three different rooms this year). 8:35: I start Precalculus class. 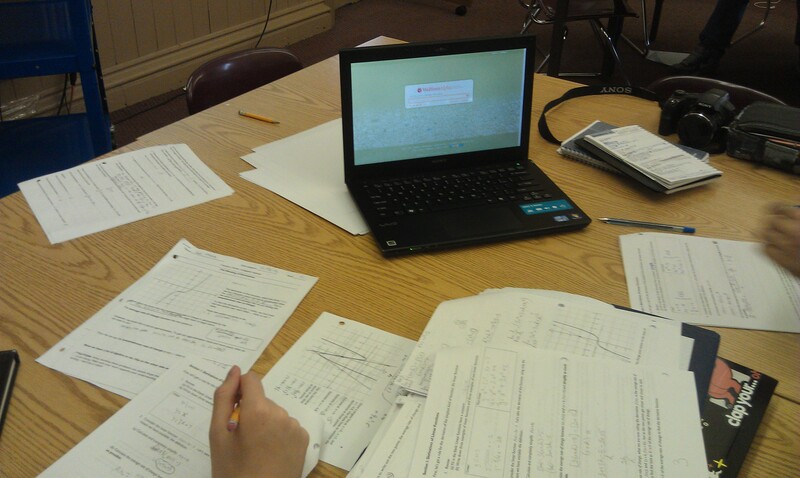 I fire up the smartboard, have kids put their nightly work in a folder for me, have kids start a warmup reviewing some of the material from the previous class (arc length and sector area), and ask two students to remind me to return tests from last week back at the end of the period. Yeah, I’m bad at remembering to hand tests back, but kids are anxious about them so they always are chomping at the bit to remind me. The class lesson goes almost as planned. Go over the warm up. I emphasize that students should not memorize formulae but think them through. They should make sense, not just be given down from on high. 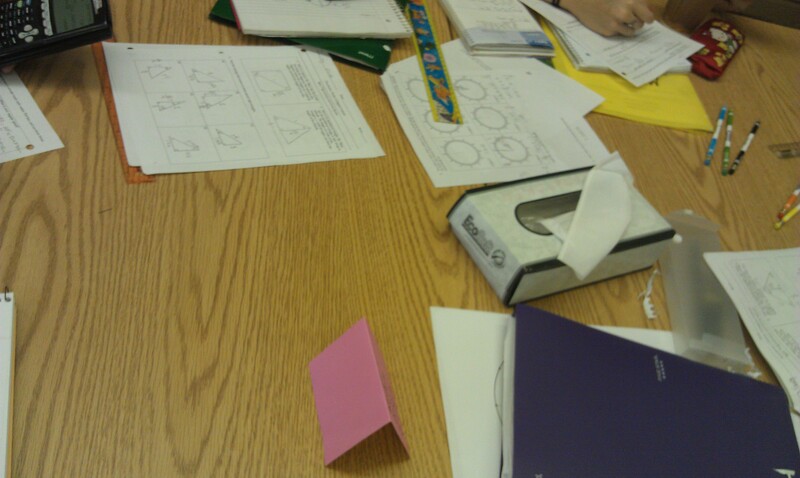 They work thoughtfully at their tables (groups of 3 and 4). Very quickly go over questions from the previous night’s work. Ask “What is 1 radian?” I am pretty sure I stole that from Kate Nowak’s blog. Get a few answers, but no one says “the angle carved out by going a distance of 1 on a unit circle.” I feel a little disappointed, as I introduced radians in the previous class and tried to emphasize where radians come from. Introduce the idea of the speed of something going around in a circle. At one point, I actually run around in a circle. Well, quickly jogged. I don’t run. I have students read something aloud. We work through something together. I have them work in their groups on solving a few additional problems while I walk around and listen. I don’t intervene much. At the end, I ask students to articulate why the linear speed of something going around in a circle is dependent on the radius of the circle, but not the angular speed. Start to create paper plate unit circles. We start to construct our paper plate unit circles, filling in the template and using different colors to represent different things. We run out of time, but I am not stressed. We will just finish them up first thing in the next class. 9:30am: I rush down two flights of stairs and start my Multivariable Calculus class. This class only has 6 students in it, and we go at their pace. Today we are starting to work on curvature. I had planned the class traditionally, but as I start it, I deviate from my admittedly lackluster lesson a bit. I asked a few conceptual questions which gave students pause. Such as: “True or False: A circle has constant curvature.” And “True or False: A circle has 0 curvature.” Those questions generate short but good discussions. And I go off track and draw a picture of an ellipse and we sketch a graph of the curvature of the ellipse based on our understanding… and then we see the true graph and lo and behold! They are one and the same! A student asks a good question about the steepness/narrowness of the peaks in the graph of the curvature of the ellipse and two students come to the rescue and answer that. At the end, I introduce the idea of the circle of osculation and relate it back to a simple warm up problem we did with curvature — and for me, this was the most beautiful and satisfying moment of class. I love the circle of osculation. After going over it, I don’t think the students love it as much as I do. As I write down some circles on the board, I think to myself how awesome it would be to make an art project which involves a beautiful curve with tons of circles of osculation. I also think about if we have crazy wackadoodle curves/surfaces in 3d, if spheres of osculation would make sense. At the end of each class, our class has a tradition where the student-who-loves-photography takes a picture of all our whiteboards, and I use his camera to take a photograph of all the students posing. We have photographs for every day. We still don’t know what we are going to do with these photographs. 10:20am: It is now time for break, which is 20 minutes. In this time, I do a number of logistical tasks. 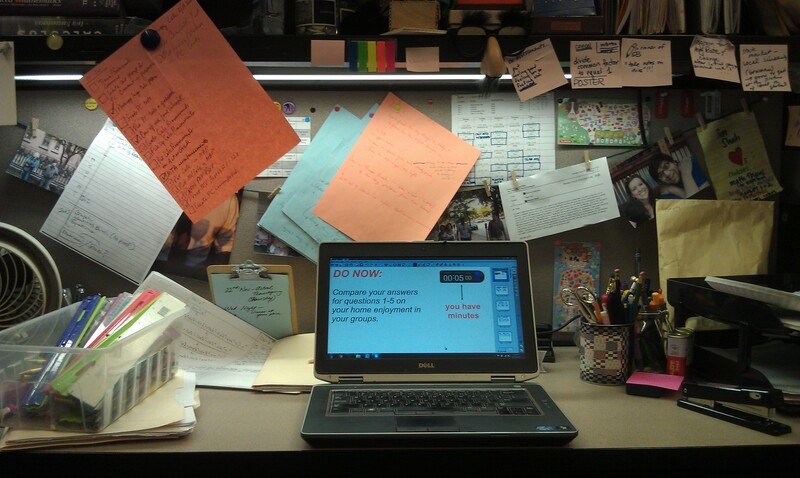 I convert my SmartBoard notes to PDFs and post online for kids to access. My computer kept not wanting to convert things to PDFs and I have a whole interior monologue cursing SmartBoard. It finally works. I post the homework for kids to access. I removing the rulers that we used today in constructing our unit circle from the precalculus group folders. 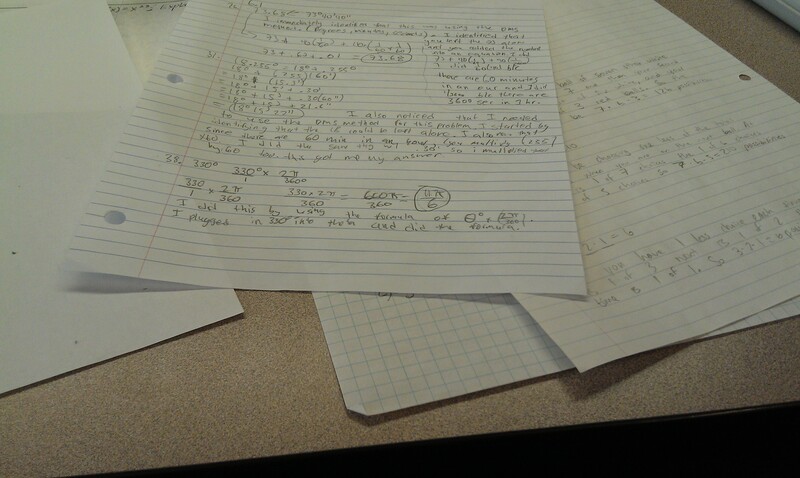 I write up the answers for the work that I collected from my precalculus students, so that I can start grading their work. Just as I finish, break is over. 10:45am: On Wednesdays, at this time, we have something call “Activity Period” which is usually filled with a speaker visiting, a musical performance by students, dance performances by students, and other such things. Today, for the sophomores, Activity Period involves going to listen to two more study abroad program presentations. 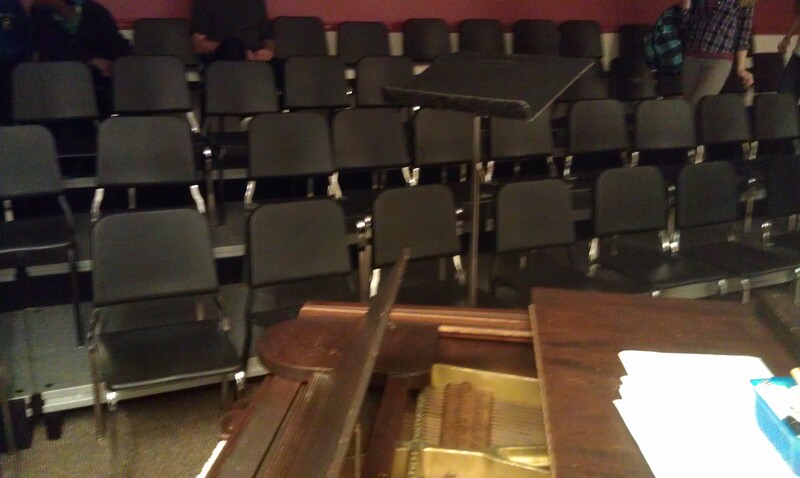 As a sophomore adviser, I go to the room with the presentations to see if I am needed to help out. I am not, so after making sure everything was hunky dorey, I return to my office to start grading the precalculus homework I collected earlier in the day. And I spend the entire period writing down feedback (and grading) these assignments. I think how much time this takes, and I wonder if the kids get anything out of the feedback I provide. But I at least get some solace when I think that at the very least collecting and carefully looking through their work lets me know where my kids are at. It is formative feedback for me. And so I read. And read. And read. Because I require lots of explanations. I do not finish. 11:40am: Lunch is upon us. And although usually I have lunch free to eat and unwind, today I have a meeting with four students and another teacher. We are working together to put together our very first issue of a math science journal at our school. The kids show up and we chat while we wait for the other teacher, who was stuck in another meeting. The kids are totally excited about this journal, and they have done a lot of work for it. I start the meeting without the other teacher, and we go around the table talking about what we have accomplished in the past week. We almost have our cover. Our logo is being worked on. Ideas for a short video are bandied about. The other teacher arrives, and we start talking about the school wide presentation we will be making soliciting submissions. All the while, I’m eating my lunch. 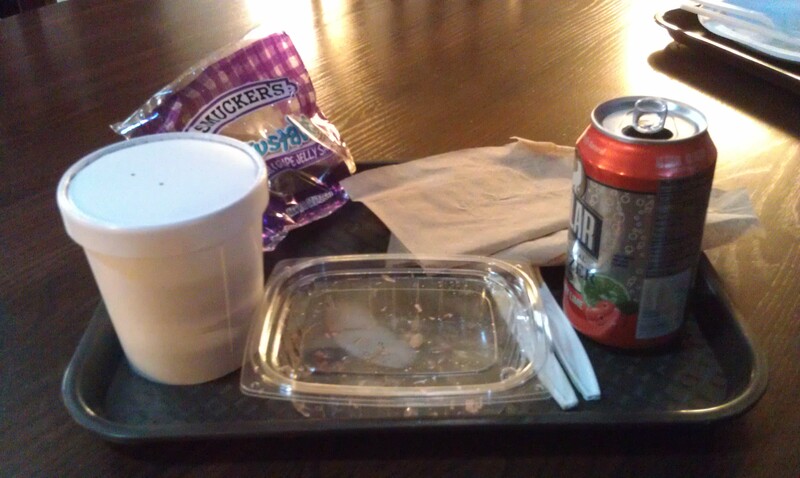 Because I didn’t have time to wait in line, because of this meeting, I just grabbed a soup and a PB&J. I am ravenous because I haven’t had time to eat breakfast today. I leave this meeting overjoyed. These kids are dedicated and passionate and continually remind me how lucky I am to get a chance to work with them this year. I haven’t seen a group of kids quite like this before since I started teaching. I hand out photocopies of solutions. The problems involve the formal definition of the derivative, and are very detail oriented. I give students a chance to compare their answers to the solutions. I ask a few pointed questions. We make a list of functions and derivatives. By this point, we have applied the formal definition a whole bunch of times. So we make a list of the functions and their derivatives. Students see a few small things, but don’t see any big patterns. I acknowledge and build on their frustration. By this point, we are frustrated with doing this. For every function we want to find the instantaneous rate of change, we have to go through 7 lines of algebra … a lot of which is tedious? Wouldn’t it be nice if we saw some patterns and then could take derivatives without using limits? I go through this. I emphasize that our goal in the next two days is to save us from this tedium. They buy in. Students take out their computers. I get them started on an activity I pretty much took wholesale from Robert Talbert, on using Wolfram Alpha to discover the power rule, and explain conceptually why it works. Students work judiciously for the rest of the period. I hear good conversations happening, and a few very distinct “a ha” moments. I ask them to finish the packet for the next class. One student says “thank you, Mr. Shah” — and she has said that at the end of every single class this year. I again think how grateful I am. 1:30pm: I meet with a student briefly about a question he had with my grading of a problem. 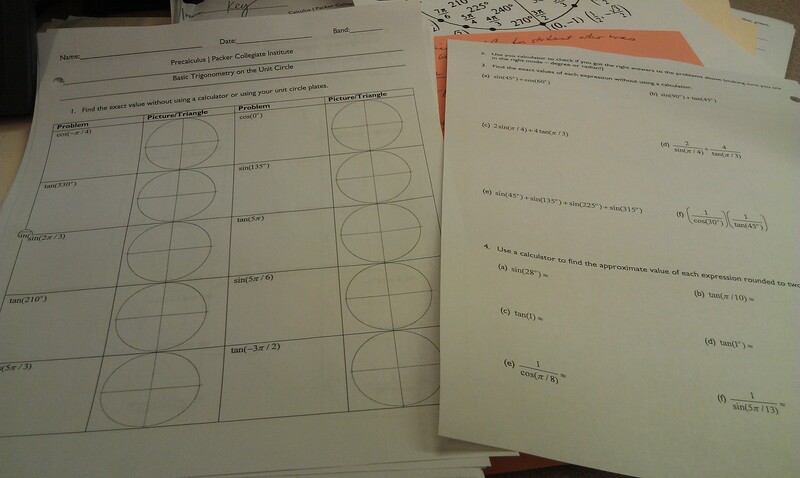 I finally finish putting feedback and grading the precalculus homework that I collected! Huzzah! I enter those grades in the gradebook. I go to the learning center to look for a test that had gone missing. (The proctor had misplaced it, but I found it.) And I quickly scribe a thank you note for a colleague in my department who made photocopies for me and said to let him know if I need anything. (Because I was out sick yesterday.) The small things matter, and every so often, when I think about it, I like to acknowledge them. 2:25pm: I have a standing meeting on Tuesdays to meet with the other calculus teacher and for us to talk about the class, see what is upcoming, strategize about ways to teach material, and write assessments together. Because I was out, we meet during the last period today. We spend most of the period writing our next assessment. I am particularly proud of one question that we crafted. It is a simple question, but it gets to the heart of what we’ve been doing, and will let us know if the kids really understand what is going on. We pretty much spend the whole period talking about calculus. 3:15pm: School is out! There is hustle and bustle in the hallway. The lower school math learning specialist pops in to ask me a question about something that he’s been working on with some younger kids — about prime numbers. We talk through it, and he leaves with some ideas. Right as we’re finishing up, a student pops in to ask me about her grade — and we go through it. I had made a calculation error, so I thank her for talking with me. Because she is a senior, and quarter grades are being mailed to colleges if students apply early, I call the registrar to see if it was too late to make the change. (It isn’t.) I make the change. 3:45pm: And then… then… I unwind for 10 minutes. Spinning around in my chair, chilling. 3:55pm: I decide to start back up with work. I run to the learning center to drop of an assessment for a student who is going to be absent and wanted to take it early. 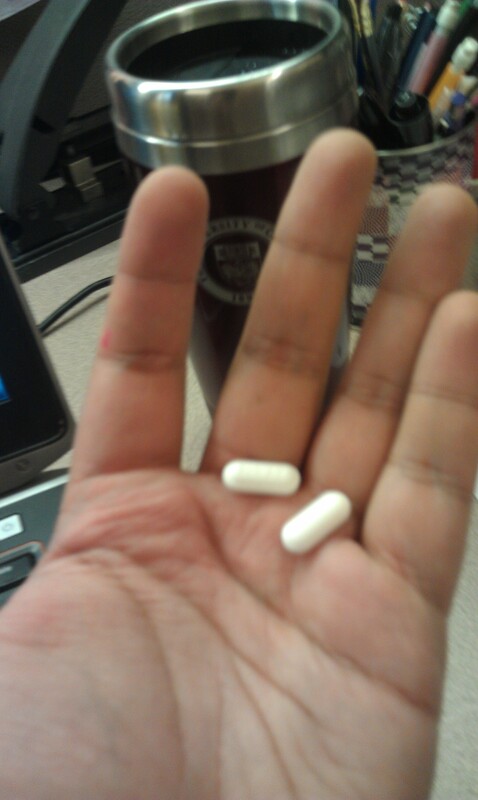 I start to get a really bad headache, probably from still being under the weather, and take two tylenol. I write a couple emails to parents to keep them in the loop on something they should be informed about. Getting the wording right is important, because this is my first contact for these parents. Finally, I start working on my calculus lesson for tomorrow. I’m working assiduously, and then another colleague stops me to kvetch. I am always game to listening to that, because it’s important to vent. 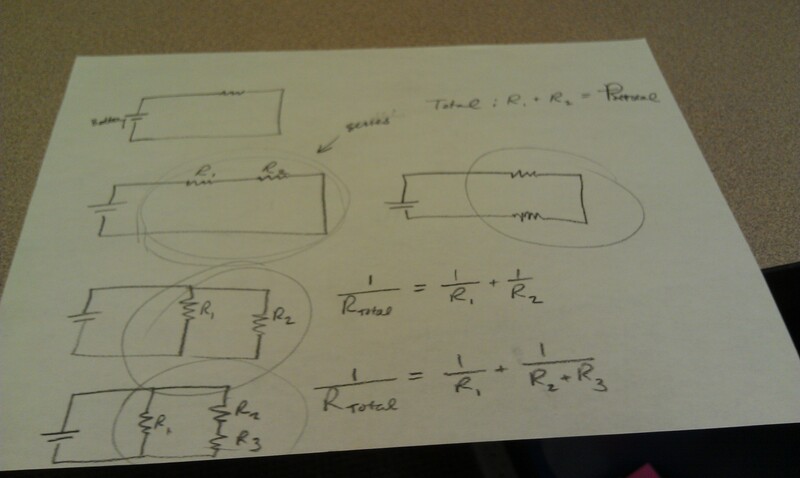 I listen, empathize, and then spend a bit of time helping this colleague on an activity she’s going to be doing in Algebra II involving resistors — an activity I did last year (and which I stole from Megan Hayes-Golding). Calculus planning continues. And continues. 6:00pm: I finish planning calculus, and I check my email. It’s from a calculus student responding to something I sent him. And it says: “I’m really having a lot of fun in this class and I am enjoying learning.” I smile, even though deep down I know I wrote something complementary to the student and this was probably just a polite response. Finally I start the gigantor task which I’ve been dreading. 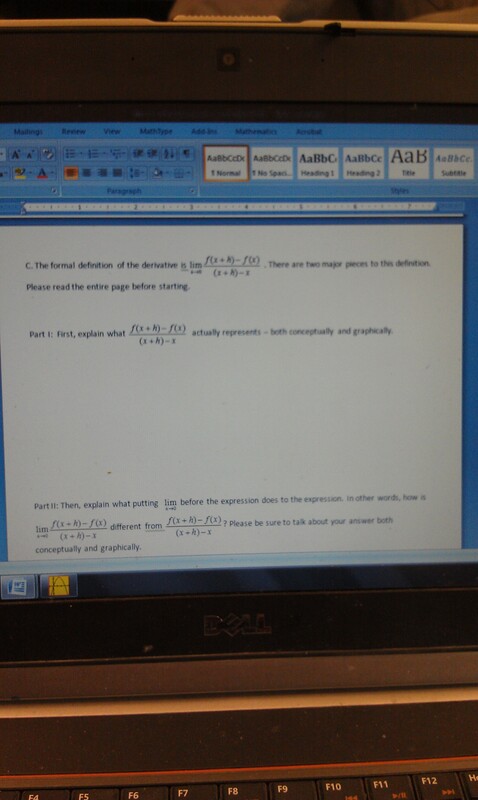 I have to create a new precalculus lesson. This is the first time I’m teaching this course, and have no materials to draw from. And there are certain lessons which you know are crucial, and the first one introducing unit circle trigonometry is key. I don’t want to mess it up. I try think through what the big idea I need to get across in the lesson are, and I realize there is just one: we are breaking free of triangles and seeing the supremacy of the circle when dealing with trigonometry. By this time there is only one other teacher in the office with me. We are using each other to stay motivated. I ask her for advice on how to introduce this topic as she has done this many times before, and I get great suggestions. I incorporate them into my SmartBoard. I also notice that the book does not have questions that correspond with what I want to focus on, so I also create a set of problems for students to work on that are more aligned with what I am emphasizing. 8:00pm: I hear a ding indicating a new message in my inbox. Then a second. I see I’ve gotten response emails from both sets of parents, and I reply back to them. Crafting emails takes time. 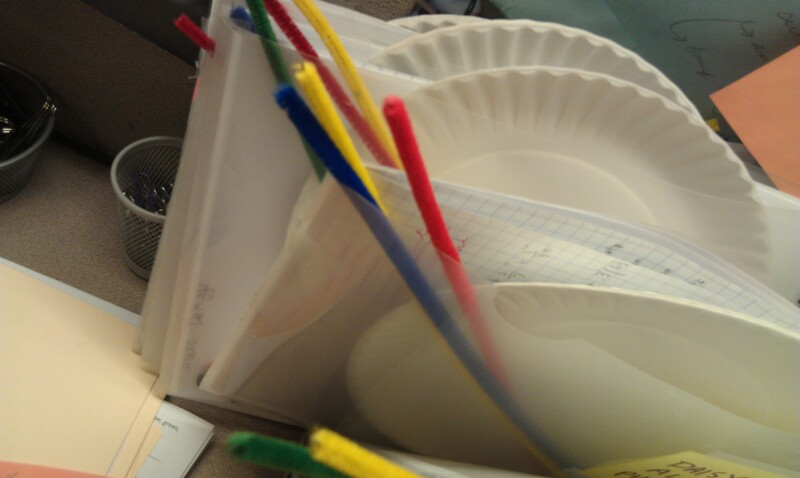 Quickly, I put the finishing touches on planning precalculus, including putting the pipe cleaners and paper plates in folders for students to have quick and easy access. Taking time to organize myself now means less wasted time in class. 8:15pm: I order Chipotle online. I go to pick it up, and around 8:45pm I take the subway home. I arrive home at around 9pm. I eat while watching The Real Housewives of New York reunion show (part 2). 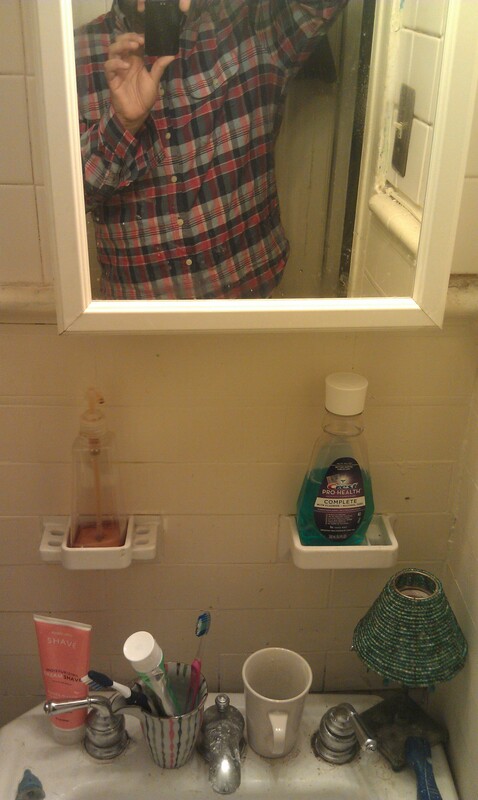 I get ready for bed. I put on C-SPAN and listen to Obama’s speech, and fall asleep. It is 11pm. I have the alarm set for 6:30am. I can’t believe you did all that on a day you were just starting to get over being sick! Bravo. I know. I was shocked I could do that too. I was winded just walking anywhere, and my headache got bad, but I worked through it. It helped that it was a really good day and I felt positive about my kids and teaching. If I was in a negative mental state, I would have just died. … So that’s what a teacher does. I never fully grasped the amount of work that goes into a class’s daily lesson (I probably still don’t truly comprehend). As a student, I see a range of effort by teachers, from full Smartboard presentations and activities (what you described) to ‘read the book I assigned last week while mess around on an I-pad’. Wow, this is one of the best comments I’ve ever gotten. A student feeling more insight in what teachers do! Thank you. 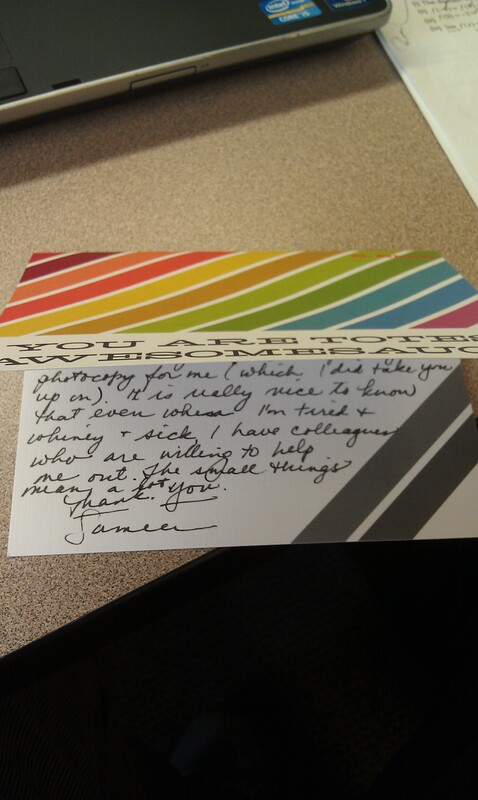 As a tutoring company manager, this gives me new appreciation for our tutors who are teachers. You have me wondering how they find time at all to tutor after school! Of course, teachers always make the best tutors, so I’m glad they do find the time. I really enjoyed hearing about specific details of a day in the life of a high school math teacher! As a pre-service teacher still in college, I feel that I only see little snippets of what being a teacher is really like during my small amount of observation hours, but you really explained the tasks that I don’t even think about, like meeting one-on-one with students, or even communication with parents. I definitely have an deeper appreciation of how involved the job of a teacher is!